This is the 34th sthalam on the southern side of river Cauvery. Thiruganasambandar and Appar has sung hymns in praise of Lord Shiva of this temple. 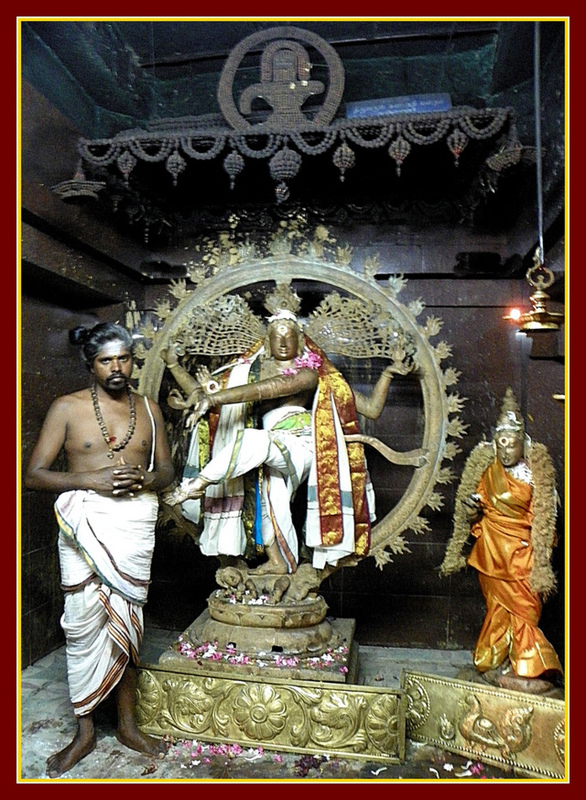 This Shivastalam is located 10 km south of Tiruvidaimarudur – on the road between Kumbhakonam and Karaikkal. Tirunallam is considered to be the 34th in the series of Tevara Stalams in the Chola kingdom located south of the river Kaveri. Worship offered here on Tuesdays and Fridays is considered special. Natarajar here, is of significance. Shiva here is referred to as Umaikkunallaar in the Tevaram hymns. 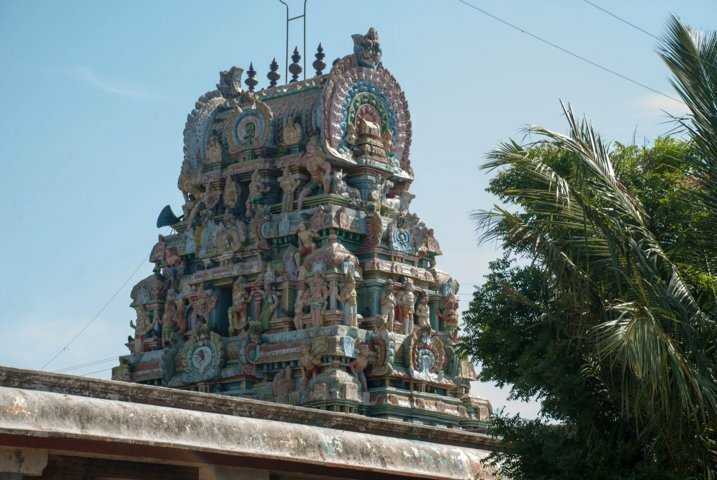 This village is famous for the Nataraja in the Shiva's temple. Lord Shiva is called as Umamaheswara and his consort devi parvati is called by the name Anga vala Nayaki or Dehasundari Amman. The temple is such a massive structure. Very very attractive with the large mandapams or halls. There is a big tank in front of the temple. This temple classified as Paadal Petra Sthalam. As per the very own words of 'Appar', one of the Tamil Saints who says, only who have poorva janma punya (benefits in the previous births only) will be able to visit this temple. Chozha King‘s wife Chembiyanmaadevi built this temple (Built stone structure). It is believed that Natarajar is suyambu. Saneeswarar has the white cloth. All the navagrahas are facing Suryan. Moolavar baanam is little big of 4.5 feet high. Iraivan shown the Kalyanakolam to Agasthiyar. Moolavar is facing west and Ambal is facing east. This temple has been built by Kandaradhittha chola and his wife Sembian Maa Devi. Kandaradhithan is the grand father of the famous Raja Raja Chola. He is well known for his service to Lord Shiva, by building huge temples in his empire. As we enter into the temple. Usually to one's right side, in any shiva temple there would be Lord Vinayaka. But here, we could see Shanmuka Subrahmanya. Yes, Lord muruga with 6 faces, 12 hands, surrounded by Valli and Devasena on his both sides. To have darshan of Vinayaka first, we move to our left side portion. There Lord Vinayaka, protected by two bhutha ganas (one with banana bunch on his head and the other with a jack fruit on his head) is seated, blessing the devotees. We then move into the main mandapam with Dvajasthambam. If we look up, on the ceiling, there we could be amazed by the awesome paintings. We can see the five faces of Lord Shiva - thathpurusham, eesaanam, vamadevam, satyojatam and agOram, moorthis of 4 vedas, and more. After praying there at the Dvajasthambam where it is believed that the power of the deity inside the sanctum sanctoram is concentrated, we enter the temple. There were also paintings of british period - policemen with arms standing at the ritual and so on. 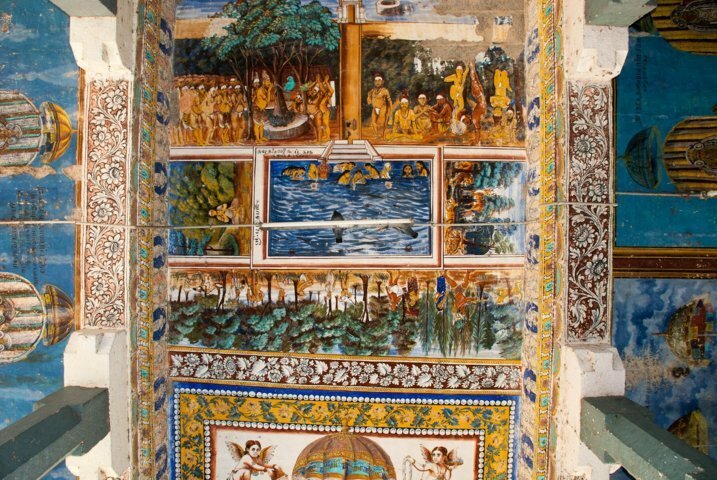 But due to poor maintenance, most of the area in the paintings got faded. We could see lord Uma Maheswara. The lingam is quite large in size that one could see the lord from the entrance. We circum ambulate the sannidhi and in the prahaaram we can see lot of other idols. Idols of Bhairava, Surya, some more siva lingams like Kasi Viswanathar, Shenbagavana Nathar and few more are there. Further proceeding we could see the Vahana Mandapam (place where God's vehicles like swan, yali (mixture of lion and elephant), ox (rishabham) are kept). All the vahanam speaks about the antique values. But again time has eaten away the charm of them. On the opposite side we could see the idols of Agastya rishi, Vinayaka and some writings, stating about the architects of this temple (Sembian madevi and Kandaradithan). After offering pradakshina and coming outside one can see the navagraha sannidhi and there is another shiva linga that has been worshiped by all the 9 planets. In the opposite side we see the majestic Nataraja. The tallest / the highest/ the majestic.. Whatever adjective that suits the best, we can use for him. There will be a mole and a hair stuck to the mole on his chest. 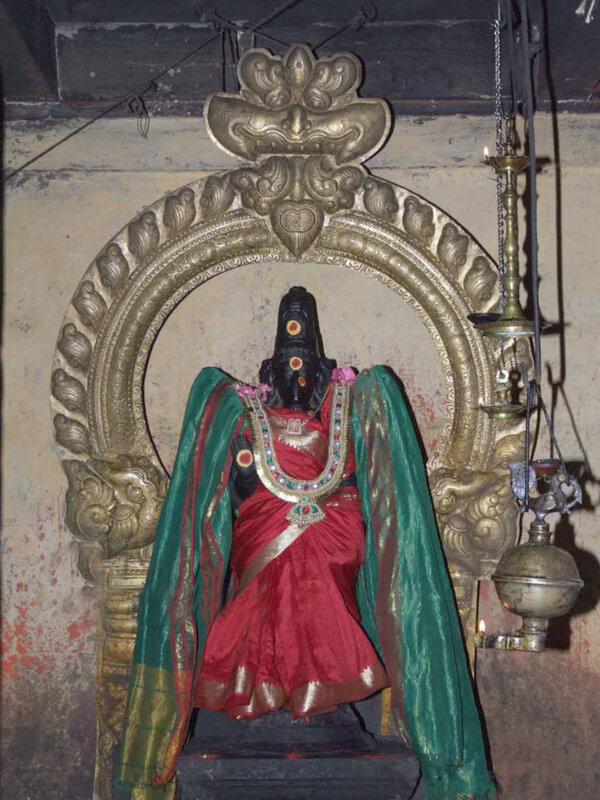 To his side, stands the graceful Sivakami. He is the moolavar. He wont be taken out for procession. To his side, there is another sannidhi where lies another Nataraja. This is the utsava moorthi who will be taken out for procession. He is also called as Kalyanasundara moorthi, also called as Maapillai swami and his consort is Devi Kathyayani. We come out of the shiva's sannidhi and go for a bigger round in the outer prakaram. There comes the Devi Sannidhi. Its like a separate temple. We offer our salutations to the Angavala Nayaki or Dehasundari and request for good health for every one of us. One could observe that there is a separate Nandi for ambal which is very uncommon in temples in and around Kumbakonam district. In few temples in other places this is very common. There is also a sannidhi of Lord Vaidyanatha in the outer prakaram, after coming out of Ambal sannidhi. 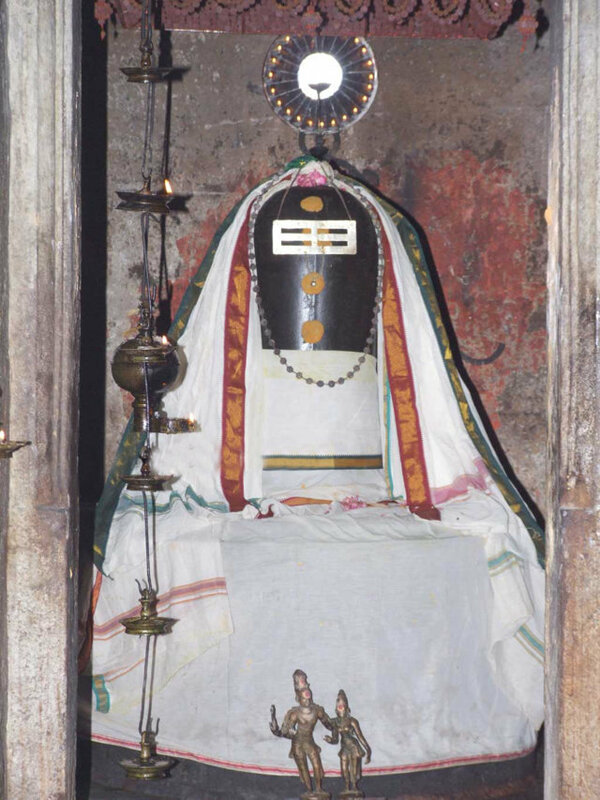 It is believed that Bhumidevi was instructed by Mahavishnu to build this temple, hence the name Bhumiswaram. It is also believed that a certain king Pururavas was cured of leprosy here, and in return gilded the temple vimanam with gold, and instituted the Vaikasi full moon festival. This temple was built by Sembiyan Mahadevi the Chola queen (of Gandaraditya). Images of Gandaraditya Chola and Sembian Mahadevi as well as several inscriptions are seen here in this temple. These images are about a 1000 years old. Sembiyan Mahadevi is believed to have provided for the upkeep of the temple and for the performance of the daily rituals. This temple is also known as Gandaradittam. The inscriptions here are of great value as they offer an insight into how, the various sections of society then were involved collectively and separately in the day to day activities of the temple. Inscriptions speak of musicians, persons who prepared sandal paste, watchmen, reciters of hymns, managers, accountants, dyers, blacksmiths, etc. The niche images of Nataraja, Dakshinamurthy, Lingodbhavar, Ardhanareeswarar in this west facing temple are all of great beauty. The mukhamandapam in front of the sanctum is known here as Pugazhaabarana mandapam. Bronze images of Natarajar, Kalyanasundarar dating back ao the 10th century are of great beauty here. This is regarded as a fully developed early Chola temple. It is well preserved, and it has the finest and richest collection of bronze images. The Chola king Kadaraditya Cholan and his wife Sembian Mahadevi were pious and asked the Sthapathi to make a Lord Nataraja's statue in five metals or pancha loha which is tall and appealing. The Sthapathi was an ardent devotee of Lord Shiva and was very happy with the King’s order. The Sthapathi is a person who works on art of making icons, with the required quantity of metal, i.e. copper brass & lead in the ratio of 82%, 15%, & 3% respectively is collected in a crucible and heated to get converted into liquid form. Simultaneously the karu (mold) is also heated. The mold becomes red hot. It is then buried in the ground up to the mouth of the mold, to get firm upright position. The hot liquid metal is poured into it. The mold is allowed to cool gradually. Then the wire bindings and iron rods are removed. The mold is broken open. Now rough metal image is obtained. Then it is chiseled, filed, and engraved to get fine ornamental statue. The Sthapathi after receiving the order, works hard and presents the statue molded to the king. The Kandaraditya Chola king isn't happy and asks him to make a Nataraja statue which is more alive, tall and appealing. The Sthapathi shows three casts of Nataraja which came upto 3 feet height but the King rejected them and gave him last chance to make it and ordered to chop his head if Sthapathi fails. The Sthapathi was very depressed as he had just a day more to present his work. He was praying lord Shiva to make his work appealing to the king and was thinking about how to start casting Nataraja. An old man and his wife came near him and asked for some water to quench their thirst. The Sthapathi wasn't in the mood to offer water and said them "There is no water". The old man asked him to offer something to drink as they had walked all the way in a sunny day. The Sthapathi lost his patience and said "If you really want to drink something, drink the molten metal". The old man immediately took the pot and drank the molten metal giving a little to his wife. Before the sthapathi could recognize what has happened, there emerged two statues, one of large Natraja and other his wife Parvathi. The Chola King walked in the same time and was extremely happy to see the statues. The Sthapathi was speechless by God's love and affection and couldn't believe that God had come himself to help him make the icons and saved his life. Later, Sthapathi conveyed the whole incident to the King. The Chola King called his tale a lie and raised his sword furiously which struck the lifted right foot of Natarajar's Icon. Blood spurted out and splashed on the King who developed leprosy. The Lord then appeared to all present there as Vrishabharoodar and told the King “I am here in the form of Lingam as Vaidyanatha. This is the only temple where one can see 'swayambu nataraja of impon statue'.... the marks of king's stroke, a mole and skin colour patch in one of the hands of Lord Nataraja and the GREAT smile on Lord Parvathi's face are just remarkable and no word can describe the real beauty of the same. Besides, in the arm pits of Lord Nataraja people witnessing the growth of dark hair depending on the waxing and waning of the moon, increases the growth and goes down respectively. 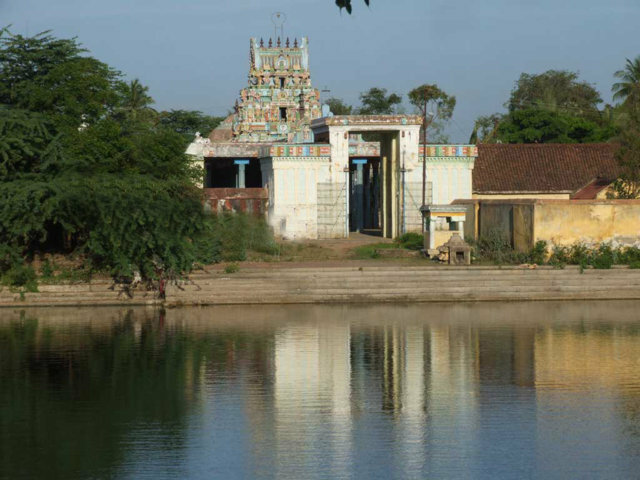 Location: This sivasthalam temple can be reached by travelling up to S.Pudur on the Kumbakonam - Karaikkal road. One branch road from S.Pudur goes to Vadamattam village. Travel on that road and reach Koneri Rajapuram Cross road stop. The temple is about 01 Km from this cross road stop. Town bus No 22 from Kumbakonam to Vadamattam is passes through the Village Konerirajapuram and the temple Thirunallam is about 500 meters.